S.T.Dupont James Bond 007 Xtend MaxiJet lighter is part of the Limited Edition dedicated by S.T. Dupont to 007 in 2004. 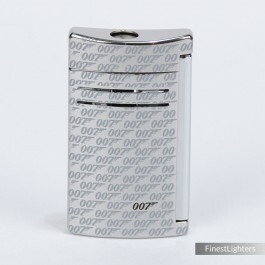 The lighter is finished in polished chrome and decorated with 007 trademarks. A great collector's item for 007 lovers and collectors, completely sold out. Please note: X-tend lighters were assembled in France at Dupont's factory, instead MaxiJet lighters, which around 2007 replaced X-tend models, are made in China. X-tend models have an “X-tend” printed on the side and a “Made in France” printed on the bottom (see pictures). For more information about S.T. Dupont James Bond 007 Limited Edition click here. You can find more information about S.T. Dupont 007 X-tend lighters at Bond Lifestyle.